Looking for a Used QX60 in your area? CarGurus has 13,298 nationwide QX60 listings starting at $11,980. Some shoppers pay more to get more space. Others seek out premium features and technology. The 2017 INFINITI QX60 offers both. Luxury can mean different things to different types of car buyers, and it has meant different things in different eras. Once upon a time it meant way-big sedans, miles of leather, and maybe even the option of power windows or a landau cover. That definition of luxury has evolved, and now cars are available with the latest in high-tech entertainment and safety features, integrated seamlessly. The 2017 INFINITI QX60 delivers that classic idea of spaciousness as luxury, as well as new entertainment and safety features. It does so by combining the best attributes of a large SUV with a car-based platform that allows it to make the most of its space and offers a surprisingly nimble driving experience. The QX60 was introduced for the 2013 model year when it had a different name. This SUV was originally called the JX35, and that name made sense. 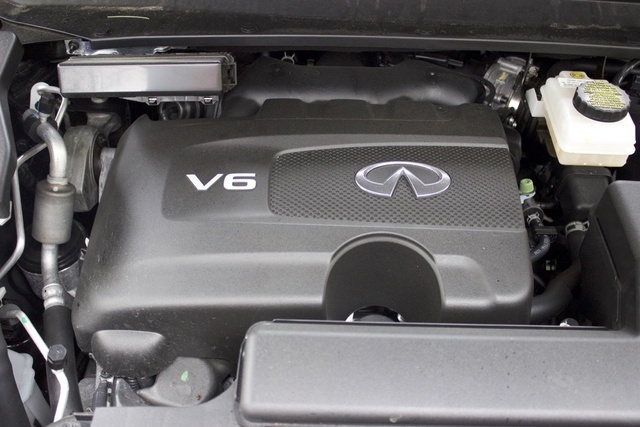 All Infiniti SUVs had an X in the name, and each one had a different other letter with a number that represented the displacement of the engine. Then, in 2014, the good folks at Infiniti had the bright idea to completely change the company's naming logic. Now SUVs still have an X in the name, but all SUVs use QX, followed by a number based on size. As a result, the QX60 exists somewhere in the middle of the INFINITI crossover/SUV lineup—above the wagon-like QX30 and QX50, but below other true SUVs like the sporty QX70 and brawny QX80. The QX70 strikes the balance of both ends of the QX lineup, with a bold front-end look, characterized by elegant lines and curves. The QX60 was updated in 2016, with some subtle changes to the lower front grille and interior. For 2017, it gets no major visual updates, but it offers a few features that represent value-adds over the previous year. The QX60 features plenty of chrome around the windows, at the bottom of the doors, and around the tailgate and grille, though it never feels excessive or gaudy. The same can be said for the demonstrative grille, flanked by menacing-looking headlights. Sit behind the wheel and you’re treated to a fantastic interior. The curves and swoops of the outside are carried over to this comfortable, well-thought-out cabin. Many new automakers are trying to go for minimalism in the cabin, and the QX60 thankfully resists that trend. It has plenty of large, easy-to-use buttons, and they are placed in a way that looks pretty good. The fonts are super-white and bright, making for a crisp look, and they're surrounded by soft-touch materials and sharp wood and metallic accents. The instrument panel and touchscreen feature purple accents that have become a hallmark of Infiniti vehicles. The seats feature leather stitching in unique patterns, giving them an aesthetic that comes off as far more upscale than the QX60's price (more on that later). From a looks perspective, the QX60 punches above its weight. The smooth cabin style is backed by supremely comfortable seats. From the style of leather to the cushioning, the seats are great for long trips—you won’t find yourself wanting to stop or fidget around. That should make this a great road-trip vehicle. The QX60 comes standard with a new 3.5-liter V6 engine. That’s the same size as the engine used in past years, but this new one makes 295 horsepower and 270 pound-feet of torque. That's up from 265 horsepower and 248 pound-feet, and the boost of 30 hp and 22 lb-ft is noticeable, to say the least. The throttle almost feels jumpy, perhaps as a result of that additional power. Acceleration comes on strong and is available at many speed levels. Power gets sent through a continuously variable transmission (CVT) to either the front wheels or available all-wheel drive (AWD). Fuel economy for front-wheel-drive (FWD) versions is 20 mpg city, 27 highway, 22 combined. AWD results in a drop of a single mile per gallon in each sector: 19 mpg city, 26 highway, 22 combined. In our AWD test car, we found combined fuel economy of 23.8 mpg. 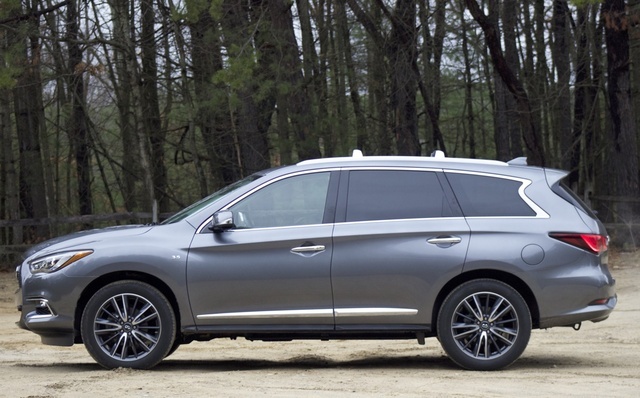 If that’s not ideal fuel economy for you, INFINITI offers a QX60 Hybrid. That model uses a 2.5-liter inline 4-cylinder combined with an electric motor and a lithium-ion battery pack. The result is 25 mpg city, 27 highway, 26 combined. The only problem is that the hybrid costs almost ten grand more than its conventionally powered counterpart. The QX60 has a drive-mode selector in the center console. The dial features Normal, Snow, Sport, and Eco drive modes. Even in Normal the QX60 has pretty quick throttle response, and Sport mode ramps that up even further. As you might imagine, Eco mode provides maximum efficiency. One part of the way it works is by providing force feedback on the gas pedal. The pedal literally pushes back on your foot so you can’t press as hard into the throttle, and it feels downright weird. You would do well to avoid Eco mode in any new INFINITI model—seriously. Steering is heavy, but not evenly so. Sometimes it feels like there's more assist and sometimes less. Pair that with its long wheelbase, and the QX60 has awkward handling moments. You'll definitely want to take care in hard turns or on highway off-ramps. But all in all, the QX60 handles well for a vehicle its size. The QX60 shares a platform with the Nissan Pathfinder, a vehicle we recently reviewed positively. 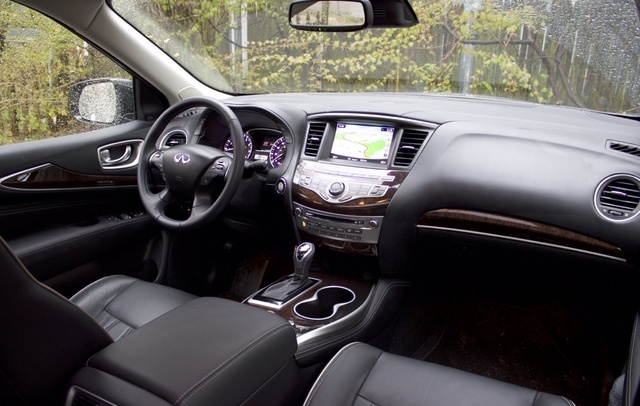 The QX60 absolutely benefits from this shared DNA, as the INFINITI SUV has very intuitive controls and a layout that both Nissan and INFINITI drivers will find familiar. 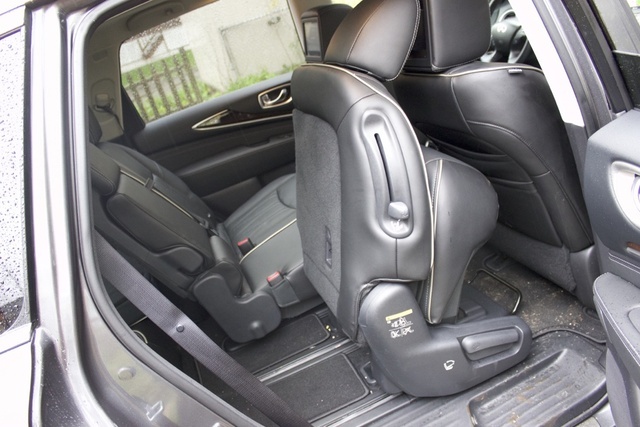 The QX60 also has three spacious rows of seating, with plenty of head- and legroom, even in the second row. The second-row seats are similar to those of the Pathfinder and have a couple of slick tricks. First, you can fold the 60/40 split-fold third row with a simple pull on the lever near the base of the seat. You can also slide it forward with the pull tab on the outboard side of the seat to provide easy access to the third row. The third row itself is reasonably sized. It’s not nearly as spacious as the second row, but adults could sit in the back for short trips without too much fuss. The QX60 benefits from the easy-to-use infotainment system that’s offered in most INFINITI models. Some feature a newer double-screen setup, but the QX60's is much better. 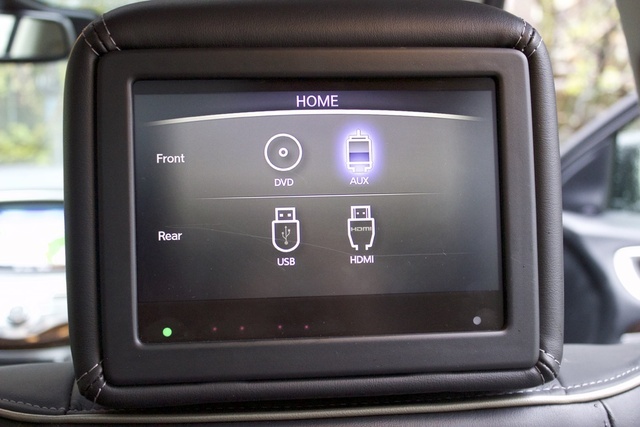 Large buttons operate as redundant controls for many functions, and it's not only easier than the newer In-Touch system but also better than the painfully complicated dual-screen setup in the rival Acura MDX. New for 2017 is an available hands-free power liftgate. This feature lets you open the power rear hatch simply by swinging your leg under the rear bumper. That’s great if you’ve got an armful of groceries or other bags. 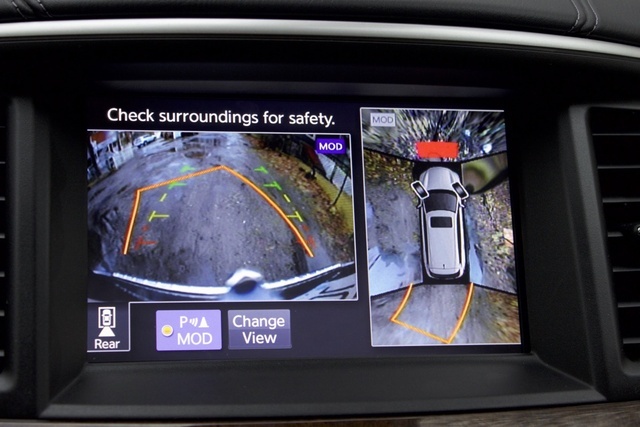 As you might expect, the QX60 is available with the latest high-tech safety equipment, including forward emergency braking with pedestrian detection, lane-departure warning, and blind-spot warning with rear cross-path detection. It's also available with a feature called predictive forward-collision warning, which can tell not only if a collision is imminent between you and the car ahead of you, but also if the two cars ahead of you are about to get into a fender-bender, giving you an extra moment to brake. Standard safety features include a full array of front and side impact airbags, front and rear crumple-zone architecture, the LATCH child-seat anchoring system, and electronic brakeforce distribution. Base MSRP for the 2017 INFINITI QX60 starts at $43,100 for the base FWD trim. The AWD trim starts at $44,900 before extras. A QX60 AWD, loaded up with all the options packages, like our test model, will cost slightly more than $60,000. In some ways, the QX60 presents itself like an upscale Nissan Pathfinder, but looking at it that way makes it seem too expensive. Compare it to the Acura MDX or Buick Enclave, and you’ll start to see the value of INFINITI’s three-row SUV. The MDX has similar pricing, but it also has such a maddening infotainment system that I almost want to write it off completely. And the Enclave feels dated compared to other three-row SUVs. The combination of a large, refined cabin and easy-to-use technology defines the QX60, making it a formidable upscale family vehicle. From open-wheel racecars to specialty off-road vehicles, George Kennedy has driven it all. A career automotive journalist, George has been a contributor, editor, and/or producer at some of the most respected publications and outlets, including Consumer Reports, the Boston Globe, Boston Magazine, Autoblog.com, Hemmings Classic Wheels, BoldRide.com, the Providence Journal, and WheelsTV. 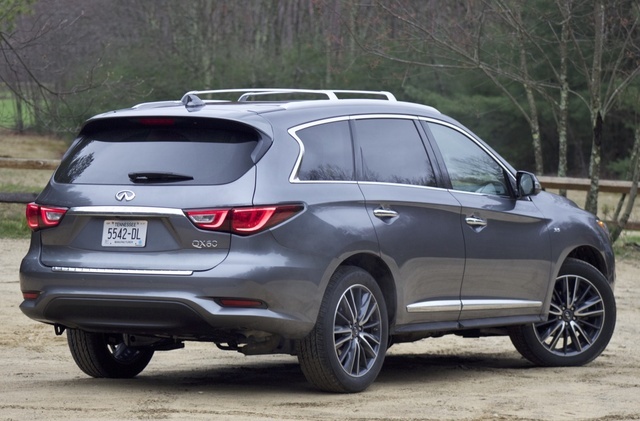 What's your take on the 2017 INFINITI QX60? Users ranked 2017 INFINITI QX60 against other cars which they drove/owned. Each ranking was based on 9 categories. Here is the summary of top rankings. 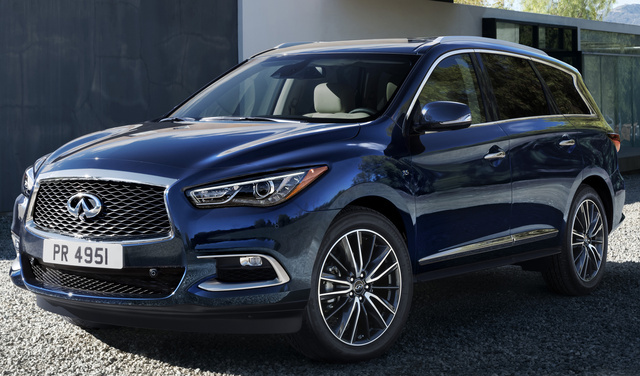 Have you driven a 2017 INFINITI QX60?